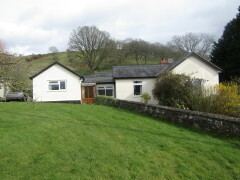 Bryn Hyfryd sits on approximately just over 2 acres and enjoys stunning views. 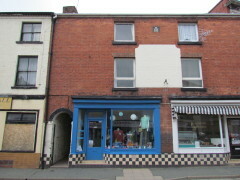 Located on the edge of the Village of Llansantffraid with easy access to good local amenities i.e. Filling station and shop, village supermarket, public house, restaurant, takeaways and village school. Within minutes to the A483 with easy access to Oswestry and Welshpool and the A5 network to Wrexham, Chester and Shrewsbury. two built-in cloaks cupboards, built in storage space, built in book case, radiator, window to front overlooking countryside views, fitted carpet. built in bookcase, sky light, picture rail, radiator, fitted carpet. picture rail, radiator, two windows overlooking countryside views, fitted carpet. original brick arched fireplace with inset multi fuel burner, two radiators, three windows, sliding patio doors onto a decked area with far reaching views, fitted carpet. Built in cupboard, radiator, bay window overlooking countryside views, fitted carpet. with low flush w.c., wash hand basin. panelled bath with Victorian style shower attachment, shower cubicle with shower, vanity style wash hand basin and cupboards below, low flush w.c., two heated towel rails, two windows. with sink, worktop, plumbing for washing machine, space for dryer, oil boiler, wall mounted cupboards, space for freezer, door to Study and door to rear entrance Porch. Comprehensive range of modern fitted units with worktops and comprising 1½ bowl single drainer sink unit with mixer tap, 4 burner hob electric oven with extractor, double oven, dish washer, fridge, radiator, three windows, ceramic tiled floor. telephone point, radiator, window to rear, fitted carpet. Radiator, 2 windows to front and side, fitted carpet. 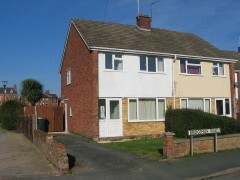 OUTSIDE The property is approached via a stone driveway leading to the SINGLE GARAGE and front entrance. Ample parking for several vehicles. 5 KENNELS, ORCHARD, SEPARATE GRASS PADDOCK. Good sized gardens laid principally down to lawn with countryside views. Ornamental ponds. Separate gated pedestrian access leading to the gardens and front entrance. A wealth of mature trees, flowers and shrubs. IN ALL ESTIMATED APPROXIMATELY 2 ACRES OR THERABOUTS. VIEWING STRICTLY AND ONLY BY PRIOR APPOINTMENT through the Selling Agents — J. J. DELL & COMPANY. Powys Country Hall, Spa Road East, Llandrindod Wells, Powys. LD1 5LG. DIRECTIONS From the office, proceed on the A483 towards Welshpool. Turn right at Llynclys cross roads and then take a left turn signposted Llansantffraid, proceed through the village, taking a 2nd right hand turn after the ‘Lion’ public house, continue along the ‘Winllan’ road until the property can be identified on the right hand side by a J J DELL ‘for sale’ board. AGENT’S NOTES All measurements set out in these details are approximate. The mention of any services and/or appliances within these sales particulars does not imply they are in full and efficient working order as they have not been tested. The Agents have endeavoured to produce accurate and reliable sales details. How ever, if there is any point which is of particular importance to you, especially if travelling some distance to view, kindly contact our Office and we shall be pleased to check the information for you.